The 1982 papers released from Whitehall this week on Anglo-Irish relations are punctuated with sharp rebukes by Margaret Thatcher to her own civil servants. “No!” she would mark in the margins of various talks and peace proposals. Her advice to her own officials was to keep correspondence with Dublin “long, worthy, meaty and dull”, with the unstated intention of doing nothing. The Irish papers also reveal that the 1983 ‘New Ireland Forum’ was originally planned as a cover for what Dublin officials admitted was “a mark-time period, in respect of dealings with the British”. Its main function was to boost the moderate nationalist SDLP following a surge in support for Sinn Fein in the aftermath of the 1981 hunger strike. The Forum’s report, published on 2 May 1984, listed three possible alternative structures: a unitary state, a federal/confederal state, and joint British/Irish authority. 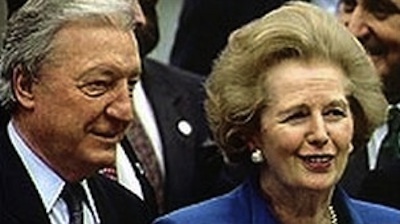 The British Prime Minister, Margaret Thatcher, dismissed the three alternatives one by one at a press conference, each time saying, “that is out”, in a response that became known as the “out, out, out” speech. But amid the stalemate on the North in 1982, the papers show that worst spat between the Dublin and London governments came when former 26-County Taoiseach Charles Haughey refused to support Britain’s efforts to reoccupy Argentina’s Malvinas islands. He had described the Falklands conflict as “a ridiculous war, a war that should not have happened”. Tensions between the two governments worsened following the Belgrano massacre, when an Argentinian ship was ordered sunk by Margaret Thatcher in neutral, international waters, with the loss of over 600 lives. Thatcher, infuriated by Haughey’s lack of support for sanctions against Argentina, asked her home secretary William Whitelaw to explore new laws to disenfranchise Irish citizens living in Britain and the north of Ireland. The move, which would have left up to half a million Irish without a vote, was ultimately abandoned. * US Senator Ted Kennedy tried to intervene with the British government’s handling of the crisis at doomed car manufacturer deLorean. The ill-fated car plant in Belfast, built with millions of pounds of funding from the British exchequer, closed in 1982 after the company went into liquidation and following the arrest of its founder John de Lorean on drug trafficking charges. De Lorean blamed the Northern Ireland Development Agency (NIDA), which had offered 100 million pounds to set up the factory, for many of the problems. However, Mr de Lorean had some influential friends in American politics. A British official said he had been contacted by the Irish Embassy which told him “that the Irish had been approached by Senator Edward Kennedy about de Lorean” so as to “bring pressure to bear on HMG (Her Majesty’sGovernment)” to inject further financial support into the company”. The memo reveals that on this occasion, his interest was not welcomed. “The Irish (I assume their Embassy in Washington) had warned Senator Kennedy that it would not be appropriate to intervene and had pointed out that the situation was a good deal more complex than it might appear,” it read. Later, an NIDA appointee to the DMC board in New York described Mr de Lorean as being “in a disturbed state and possibly not wholly rational”. Reporting from a meeting of the board to discuss the future of the company, he said it was “a shambles”, “a fantasy” and “an orchestrated pantomime” with “a good deal of abuse from Mr de Lorean”. * Confusion and embarrassment reigned when the late president Patrick Hillery, acting on government and official advice, gave two contradictory responses to the birth on June 21st, 1982 of Prince William to the Prince and Princess of Wales. The recommendation from the Department of Foreign Affairs was that the president should not send congratulations, since Prince Charles was not a head of state, but this was countermanded within hours by a government decision. * The British embassy in Washington claimed that republican veteran Dessie Ellis, who was arrested in the US in 1981, was “linked by forensic evidence to some 50 murders”. Mr Ellis was extradited in 1983, and sentenced in Dublin for the explosives offences. He went on hunger strike for 37 days in 1990 while facing extradition to Britain. He was ultimately acquitted in London, and is now the serving Sinn Fein TD for Dublin North-West. A Sinn Fein spokesman today said Dessie Ellis rejected the claims. “Irish Republicans do not attach any value to claims made in secret documents emanating from the British secret services, who were responsible for countless murders in Ireland during the course of the conflict,” he said. * Hundreds of files were again withheld in the annual release of government papers this year, most noticeably in relation to British accounts of the 1981 hunger strike. In many cases, papers were partially blacked out or censored in order to protect identities and/or British interests.